Preparing Your Will from People's Law School is for people who are preparing a will in British Columbia. It explains how to prepare a will, what to consider when appointing an executor, and next steps after the will is finished. How is a will different from a power of attorney or representation agreement? · What is a “living will”? · Do I need to prepare a new will if I move between provinces? 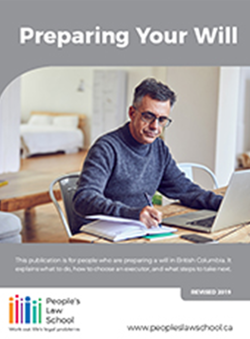 Preparing Your Will © People’s Law School is, except for the images, licensed under a Creative Commons Attribution-NonCommercial-ShareAlike 4.0 International Licence. At People's Law School, we believe accurate, plain English information can help people take action to work out their legal problems. This publication explains in a general way the law that applies in British Columbia, Canada. It is not intended as legal advice. For help with a specific legal problem, contact a legal professional. Some sources of legal help are highlighted in the "Where to Get Help" section. People's Law School is a non-profit society in British Columbia providing free education and information on the legal problems of daily life. This page was last edited on 8 March 2019, at 17:57.